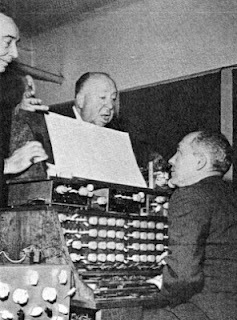 Hitchcock works with composers Remi Gassman and Oscar Sala on the soundtrack for The Birds. This keyboard was used to created a large variety of sounds, from the birds' shrill caws to a subtle, electronic silence as they prepare to attack. This playlist only features works that are - for lack of a better description - heavily influenced by the birds. There are brief passages in Beethoven's Pastoral Symphony and various of Mahler's symphonies that mimic bird calls, but I did not include them here. Some obvious and overplayed choices were also skipped, like Vivaldi's Four Seasons (instead I included his flute Concerto "Il gardellino", or The Goldfinch). Two tracks from Janáček's On an Overgrown Path bookend this playlist: about people chatted like swallows and the barn owl that did now fly away, respectively. In between them are 42 other works, from Mozart's starling to Saint-Saëns' Swan. Among my personal favourite are Xenakis' Nuits (Night) and Vasks' Plainscapes, both employ choir forces to create bird-like sounds in unforgettable ways. For practical reasons I only put in three tracks from Messiaen, and a recording of Blackbirds singing as a postlude. You can find more recordings of various European and Israel birds, which Messiaen quoted, in that BIS album (scroll down to end of the playlist and click album title). Get this collection in one Spotify playlist: Classical Music That Imitate Or Use Birdsong (45 tracks, total time: 5 hours) Ctrl (CMD) + G to browse in album view. See full tracklist in embedded Spotify Play button below. Further readings: Bird vocalization and Our Sonic Environment and the SoundScape on Sound Research. P.S. The Spotify app for this blog is live today, it's called Ulysses' Classical. Please add to your Spotify sidebar and share with friends if you like it, thanks. More news to follow soon. Sorry! I didn't scroll down far enough. I see you have it already. Just delete these comments so your readers aren't irritated. But I do like your app! Thank you for the list. I see that you included one of the pieces of Respighi's "The Birds", and that's great. I would suggest to include the third part of his "Pines of Rome" as well, i.e. "I pini del Gianiclo", which includes a recording of actual birds singing. The recording should be played while the orchestra plays pianissimo. The Bank has its branches functional throughout the globe, adding to the economic progress. Citicards Login as well as dream to do so then you are needed.